Vacancies have reopened! Everyone's favorite teenaged psycho returns as the focus of 2016 Breygent Bates Motel Season 2. Covering the second season of the series, collectors can find several chase inserts in addition to autographs, props and costume relics. The format mirrors previous releases that work as a factory set. This includes a 72-card base set that chronicles each of the ten episodes from the 2014 season. 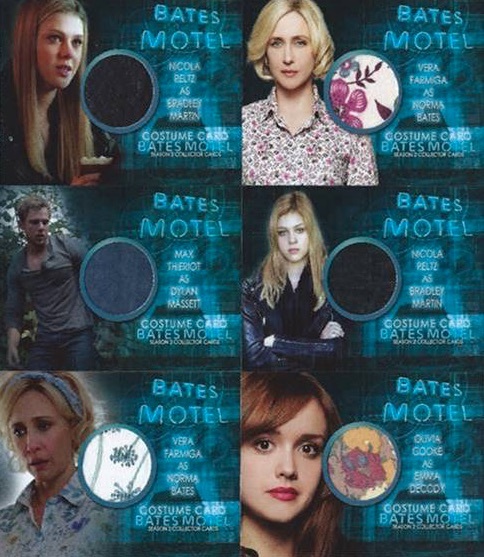 A key component for many collectors, 2016 Breygent Bates Motel Season 2 also includes Autographs, Prop Relics and Costume Relics for the top names in the show and various guest stars. Key signers include Freddie Highmore as Norman Bates and Vera Farmiga as Norma Bates, among others. Additionally, there are a trio of chase inserts to track down and each falls two per box. Bates Property focuses on the motel itself, while Norma & Norman: Love/Hate Relationship analyzes specific character dynamics. Rest in Peace closes things out with a look at the deceased subjects. These are mock-ups and not final cards. Designs and contents subject to change. 72 cards. 1 full set per box. PARALLEL CARDS: 1 per box. 11 cards. 6 single relics and 5 dual relics. Hi how many total cards were manufactured and how many autographs were distributed?